…a little bit on the dark side….. Anyway, getting back to my card today. I’ve been looking through some stamps that I haven’t used for a while as I wanted to make a floral card. 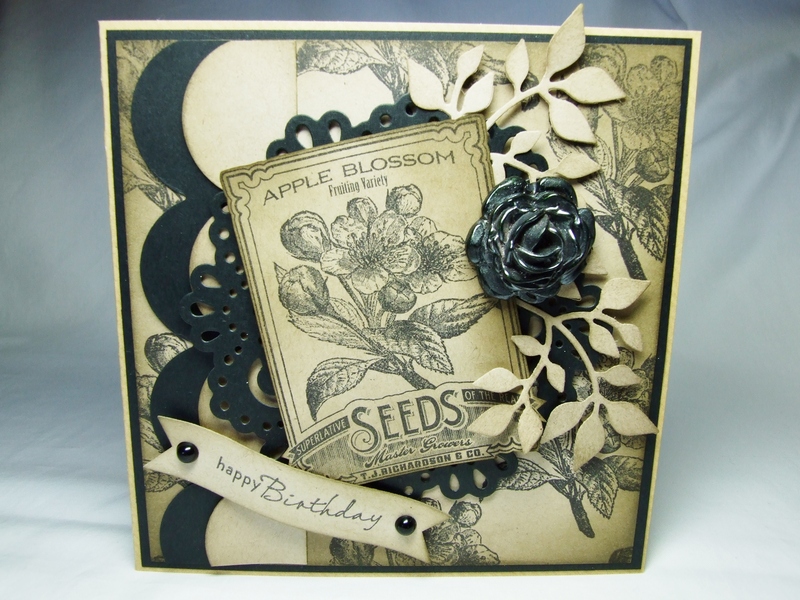 I found 2 sets from Waltzingmouse Stamps – ‘Vintage Garden Flowers’ and ‘Vintage Garden Appleblossom Seeds’. These are beautifully detailed stamps. I think I must have changed my mind half a dozen times of how I was going to do it! I knew I wanted to use just 2 colours – 1 of them being the lovely natural Kraft colour of the Neenah Desert Storm card and, for the first attempt, white embossed appleblossom flowers. However, this stamp is so intricate that I lost quite a lot of detail in the embossing. So I scrapped that and just repeat stamped the background – all appleblossoms – in black ink. So there I had the colour scheme – black and brown! 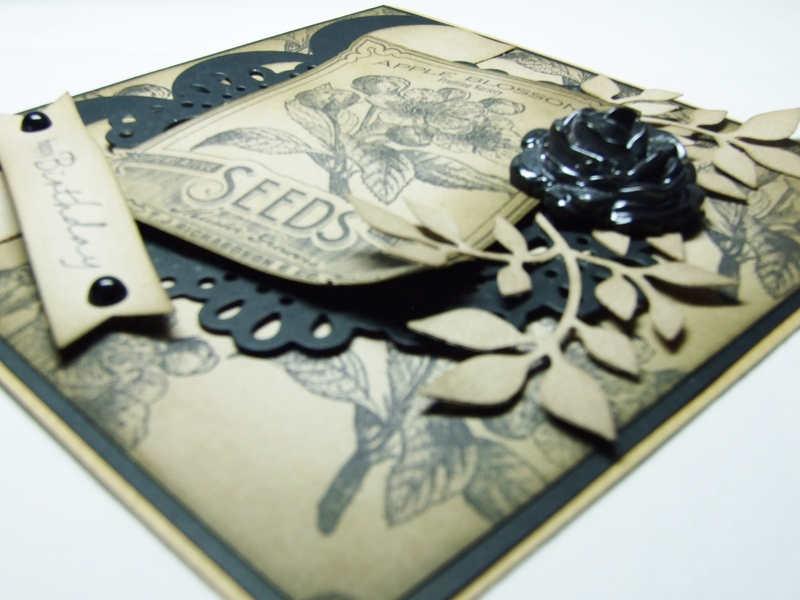 I stamped the seed packet and cut that out and distressed the Neenah card to make it look more vintage but then worried that it looked a little bit on the dark side! By the time I added the rose embellishment which I had made ages ago with my melt pot and UTEE, and the other little bits I really liked how it all came together! I just need to make a box for it now as there is no way it’s going to fit in an envelope with that rose on it!! I used:Neenah Desert Storm cardstock, black cardstock ,Marvy Heritage Timeless Sepia distress ink, Memento Tuxedo Black inkpad, Sizzix Scallop Border die, Sizzix Flowers Branches and Leaves Sizzlits dies, Die-sire Round Doily Die, Kaisercraft Banner die, black pearls, Martha Stewart Silicone Mould and all stamps from Waltzingmouse Stamps. Beautiful card! Love the fabulous vintage design! Just gorgeous, Karen! What a vintage beauty! 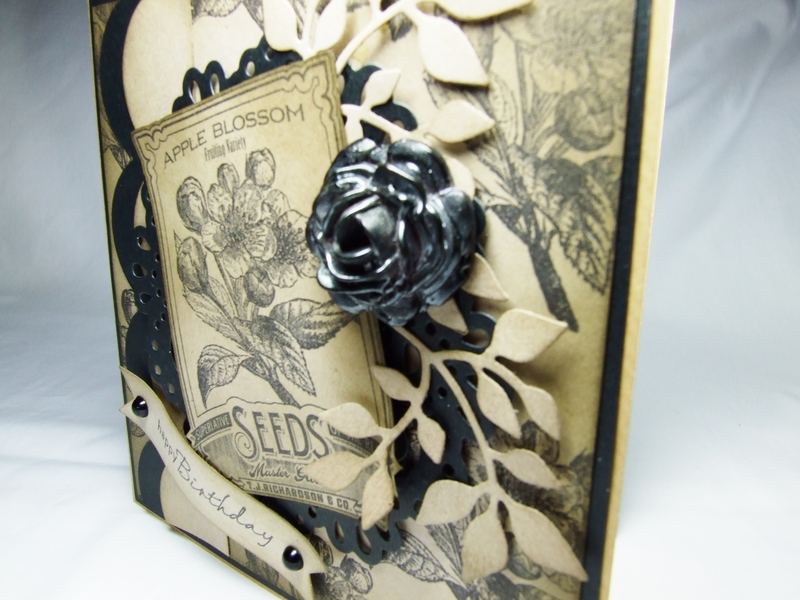 Love the dies you used and the seed stamp for the focal point! The rose embellishment is stunning! Such a pretty card…love it! :-) Hope your Mom and Dad had a wonderful birthday! And, happy early 8th birthday to your son! I’m glad you persevered. It is lovely!